I have always maintained that Henson is exceedingly cruel, but this seems a little ridiculous. We bought him a little plush monkey-friend. The monkey was about two inches high and very cute and squishy. We figured Henson would chew on it and carry it around for a few days, even weeks, before it eventually got worn out and was destroyed. 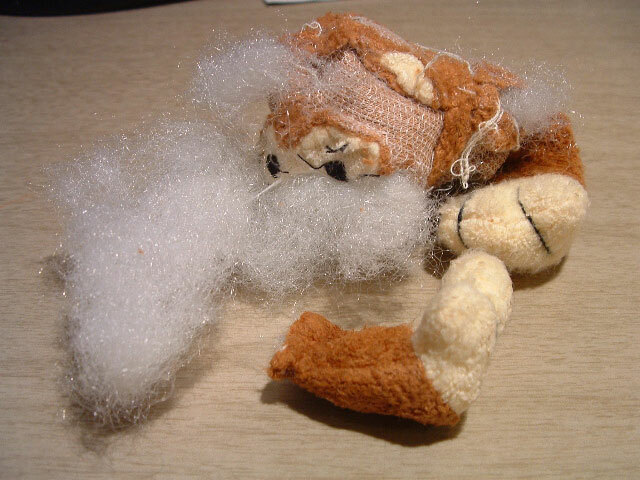 The picture at left shows the state of the tiny cloth-and-stuffing monkey after spending only one hour in our house. Schadenfreude indeed. I think that’s hard proof that Dachshunds are German. Der eveeel. It’s t00 much. It’s a mirtacle 5 is still alive! Yes, it is a mirtacle. A huge mirtacle. He chases her around every chance he gets, and I’ve seen her perform some fairly dangerous acrobatic maneuvers to get out of his reach quickly. Now we know why. I was thinking it would be fun for Henson and Speak to play over Christmas, but now I am starting to have second thoughts….. It seems his bite is catching up with his bark.